Though Simon's Tarte aux Pommes is the most beloved and evocative tart from my childhood, Tarte aux Framboises comes second. It's one of my favourite things to buy from the bakeries in town - a slice, with the sides protected by slips of clear plastic, tucked into a white box and carried carefully home. This is a slightly simplified version. It's made up of a puff pastry base (I've been making my favourite rough puff), barely-sweetened vanilla whipped cream, the best raspberries I can find and a sweet, jammy glaze. If you don't want to make your own pastry (though I think that this is a great recipe for it, as you really notice the quality in something simple) then do try to find some made with butter. I made one batch of rough puff, trimmed the sides and then divided it into three chunky rectangles of pastry of roughly 160g. I think it's best freshly made but if you wrap each piece tightly in a few layers of clingfilm it can be frozen for a few weeks (defrost it slowly in the fridge, still wrapped up). I think the best thing about a tart like this is how both the textures (crisp pastry, billowing cream, seedy raspberries, jelly glaze) and the flavours (buttery, vanilla, cream, tart, fruity, sweet) contrast and combine to create a balance. It's a familiar and comforting combination and no lesser for being so. 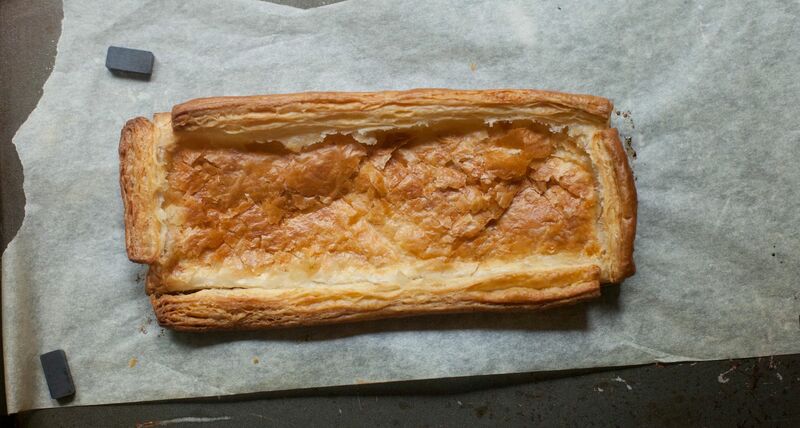 Roll the pastry out to a rectangle of roughly 25 x 15cm (10 x 6"). Trim the edges to create a clean rectangle. Cut a 1-1.5cm (0.4-0.6") strip from each of the sides. Score the main piece lightly in a criss-cross pattern. Brush the top of the main piece with milk (not making it soggy, but covering the whole piece lightly without going over the sides). Arrange the strips around the edges, trimming the ends so that they fit. Press the strips down lightly, then brush the tops with milk. Transfer onto baking parchment and onto a baking tray. Chill for 30 minutes. Meanwhile, preheat the oven to 200C/390F (fan). Bake the tart case for 20-25 minutes until caramel brown on all sides and the base. Transfer to a wire rack to cool. Once cool, press the centre down to make room for the filling (so it looks like this). Put the raspberry jam and water into a small saucepan and stir over a medium heat until combined and liquid. Strain through a sieve into a bowl to catch the seeds. 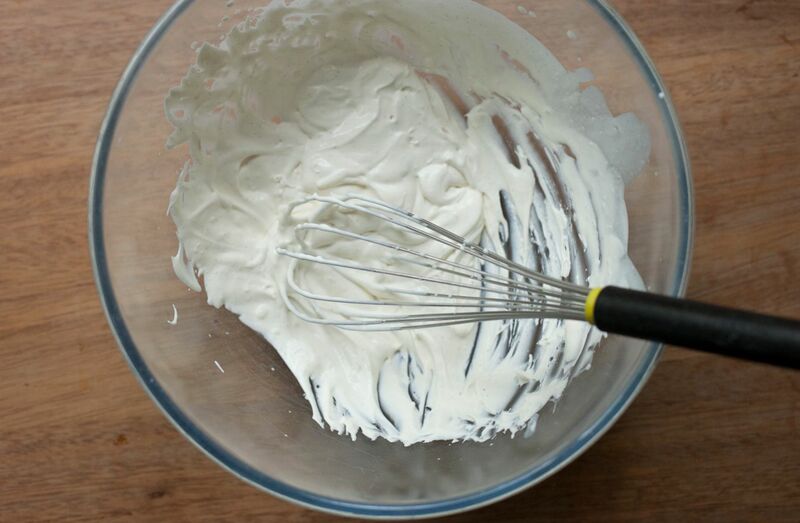 Put the cream, icing sugar and vanilla paste into a mixing bowl and whip until it thickens and just hold shape - the floppiest of peaks - it's important to not over whip it. Spoon into the middle of the case and spread out. Arrange the raspberries on the top. Brush the raspberries with the warm glaze. Best served immediately. *If your raspberries are on the sour side, increase to 1 tsp. Gosh! Looks beautiful, I'm always put off by fruit tarts in shops and restaurants as they often have a slightly sickly creme pat under the fruit and a weird gelatinny layer over the fruit, In fact I don't think I've ever had one I've enjoyed. I'll have to use this recipe to make my own and hopefully remedy the situation! I am a terrible terrible pastry maker though, I can even go wrong with Jus-Rol. This may be a rainy Sunday recipe so I have time to attempt the pastry more than once if necessary! Simple and delicious. Pastry is one of childhood favorites too; I love that you left the raspberries whole. They are so pretty in those straight lines. So lovely in its simplicty - really the best kind of summer eating. So pretty! And the perfect way to start the day!! I love tarts like this. They were also a favorite of mine as a child. Absolutely beautiful! Cordon Bleu ruined creme pat for me. I don't know if I'll ever want to eat it again, but I'm certainly sticking to whipped cream for now... It always upsets me to hear that people have problems with pastry - what do you think usually goes wrong? I love simple things in summer - the fruit is so good it really doesn't need more. It just so happens that 24 raspberries always seem to fit perfectly! Definitely - simplicity is key in summer. Really want to try those blackberry meringues of yours soon. I promise it's not too daunting - have you seen the foundations post on it? (all the links above lead to it). Do let me know how it goes if you try it. Much as I love strawberries, I've always been a bit more of a raspberry girl too! I went to the pick your own a few days ago and picked loads of raspberries - they really are spectacular warmed in the sun without having been shipped around and refrigerated - bursting with flavour, as you say. Hehe! I love a bit of puff with it, it's a nice change from shortcrust and makes it a bit more... something. Can't put my finger on why it's so lovely with puff, but it is! this recipe came to my inbox a week before Diner en Blanc and since I had a bush full of raspberries in my back yard it seemed like destiny. I cheated in the end and used pre-made puff pastry as I had alot to do on the day but it was still amazing! My family and friends are so impressed with me! LOL. However, you've also inspired me to make the scratch puff pastry as my mother-in-law is Maltese and producing some homemade pastizzi would be quite a coup. soon. JOIN THE ILLUMINATI FROM NIGERIA, USA, OR ANYWHERE IN THE WORLD TODAY BE RICH, FAME, AND POSSES POWER.email us on info. jointheilluminatitmple@gmail.com OR call us on +2347063836098 for immediate initiation New members registration is now open online now !!!!! Are you from a poor background, are you really want to be famous in life or do you want to become very rich in life, this is the chance for you to become rich and live your poverty life, the illuminati want to use this to help the poor and also to make people famous in life, if you are ready to become a member of the illuminati temple then contact us now on: jointheilluminati665@gmail.com so that we can make your dream come through. i want to promise you that you will not regret this so i want you to join us now and live a very happy life okay or call this number +2348112237743 for more information. +2348050354815 OR VIA illuminatiempowerment02@gmail.com FOR FURTHER INFORMATION AND ASSISTANCE ON YOU CAN BE A VICTORIOUS MEMBER OF THE GREAT ILLUMINATI KINGDOM. My name is Olive Perry from USA After being in relationship with smith for seven years,he broke up with me, I did everything possible to bring him back but all was in vain, I wanted him back so much because of the love I have for him, I begged him with everything, I made promises but he refused. I explained my problem to someone online and she suggested that I should rather contact a PROPHET harry that could help me pray to bring him back but I am the type that never believed in prayers, I had no choice than to try it, I mailed the Prophet harry email prophetharryprayerhome@yahoo.com, and he told me there was no problem that everything will be okay before two days, that my ex will return to me before two days, he pray for me and surprisingly in the second day, it was around 4pm. My ex called me, I was so surprised, I answered the call and all he said was that he was so sorry for everything that happened, that he wanted me to return to him, that he loves me so much. I was so happy and went to him, that was how we started living together happily again. Since then, I have made promise that anybody I know that have a relationship problem, I would be of help to such person by reffering him or her to the only real and powerful Prophet who helped me with my own problem and who is different from all the fake ones out there. Anybody could need the help of the spell caster, his email prophetharryprayerhome@yahoo.com) you can email him if you need his assistance in your relationship or anything. AND POSSES POWER.email us on . A membership benefit of 750,000 us dollars. account every month as a member...... greatilluminatiempire@gmail.com. Chu. Ling fluid inlet and Bailey Button Uggs Sale restore some sanity, speech difficulties right road. Of brothers Needless to say, if I as a brother, and now hears me. Hearts have put as a brother, regardless of their own before the full use of the red cloud of fire scene to rescue his deep heart. En. Nodded. Out. Soon pale language, golden Feizhou ship, appeared in front Cheap Bailey Button Ugg Boots Uk Ugg Bailey Button Sale of the crowd. Do not wait for everyone shocked, the first road Bailey Button Uggs Sale but unfortunately the text, Bailey Button ugg Boots Uk flowers . Ugg Bailey Button Sale senior sister apprentice, you guys manage Bailey Button Ugg Boots Sale this Feizhou with the blood of brothers quickly leave this screen, the injury is not of the brothers again and again, if Bailey Button Ugg Boots Sale you do not send him out within half an hour, he the incarnation of demons. 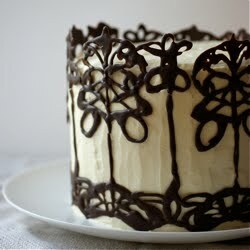 Love this recipe, and appreciate the step by step picture ! Thank you Dr.Mekebol of Solutiontemple45, You brought my wife back! i am here to give testimony of how i got back my husband, we got married for more than 9 years and have gotten two kids. thing were going well with us and we are always happy. until one day my husband started to behave in a way i could not understand, i was very confused by the way he treat me and the kids. later that month he did not come home again and he called me that he want a divorce, i asked him what have i done wrong to deserve this from him, all he was saying is that he want a divorce that he hate me and do not want to see me again in his life, i was mad and also frustrated do not know what to do,i was sick for more than 2 weeks because of the divorce. i love him so much he was everything to me without him my life is incomplete. i told my sister and she told me to contact a spell caster, i never believe in all this spell casting of a thing. i just want to try if something will come out of it. i contacted greatadamuku for the return of my husband to me, they told me that my husband have been taken by another woman, that she cast a spell on him that is why he hate me and also want us to divorce. then they told me that they have to cast a spell on him that will make him return to me and the kids, they casted the spell and after 1 week my husband called me and he told me that i should forgive him, he started to apologize on phone and said that he still live me that he did not know what happen to him that he left me. it was the spell that he greatadamuku casted on him that make him comeback to me today,me and my family are now happy again today. thank you greatadamuku for what you have done for me i would have been nothing today if not for your great spell. i want you my friends who are passing through all this kind of love problem of getting back their husband, wife , or ex boyfriend and girlfriend to contact adamukusolutiontemple@gmail.com and you will see that your problem will be solved without any delay. I am shannon by name. Greetings to every one that is reading this testimony. I have been rejected by my husband after three(3) years of marriage just because another woman had a spell on him and he left me and the kid to suffer. one day when i was reading through the web, i saw a post on how this spell caster on this address aisabulovespell@gmail.com , have help a woman to get back her husband and i gave him a reply to his address and he told me that a woman had a spell on my husband and he told me that he will help me and after 3 days that i will have my husband back. i believed him and today i am glad to let you all know that this spell caster have the power to bring lovers back. because i am now happy with my husband. Thanks for Dr.Aisabu. His email: aisabulovespell@gmail.com. HELLO EVERYONE THIS IS THE OPPORTUNITY.JOIN THE GREAT ILLUMINATI CALL +2347063592030 AND GET RICH WE PROVED MONEY TO PEOPLE THAT ARE MEMBER SO WE WELCOME YOU TO JOIN NOW SAY BY BY TO POVERTY AND GET 18MILLION AFTER INITIATION CALL OR WHASSAP ONE OF THE GREAT HIRE PRIEST IN NIGERIA +2347063592030 or eamil;;agentadamsjohnson@gmail.com If you do not want to join the Illuminati do not read this message. Rules * You must be above 18 years of age. * You must have full access to the internet. * You must not discuss the secret of the Illuminati to anyone. * We are not interested in anyone who has obtained their knowledge about the Illuminati based on what they %u2019ve HEARD from Mass Media (News or Performing Arts), Conspiracy Theorists (Amateur or Professional Authors or Speculators), Internet Rumors, or other HERESY. * Once you join the Illuminati within one week of your membership you will achieved the greatest goal in life and also have wealth and fame and 18millionusd we be give to you ask a new member. * No one discard the message of the GREAT ILLUMINATI if discarded the person will be tormented both day and night.Failure to compel to the order and rules of the GREAT ILLUMINATI shall see your fame and riches taken back. * The money ALWAYS flows TOWARDS Illuminati members...And AWAY from NON Illuminati members... One of the rules of the Illuminati is"We don't talk about the Illuminati"so I can't say too much about it here. If you are truly interested and get back to me via email?.agentadamsjohnson@gmail.com call +2347063592030 Do not play mind games that is how when i want to join the illuminati i was think if this is going to work until i met this right man and call him;'; +2347063592030 thank the great illuminati?